ThinkServer always meets the demands of performance enhancement and feature enablement by continuous improvement on products and options. Upgrading your systems with new options can provide increased flexibility, scalability, and field-proven reliability. 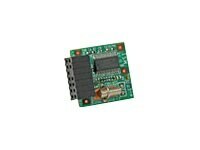 This is a Gen5 Trusted Platform Module (TPM) v1.2 for select Lenovo ThinkServer servers.